On March 4th, 2019, Luke Perry died of a massive stroke that occurred 5 days earlier. Read the article at the TMZ website. If you are looking for the website, it is here. These guides contain a reference to all ten years of the series. Also included are cast images, movies and audio from the opening/closing theme music, to show how the cast and music has changed over the years. 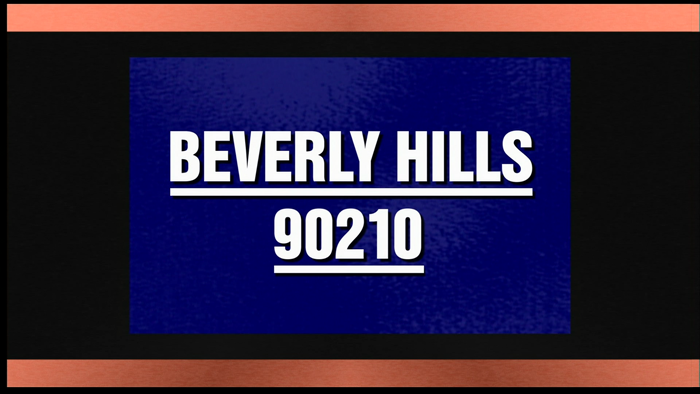 90210 MAKES IT ONTO JEOPARDY! 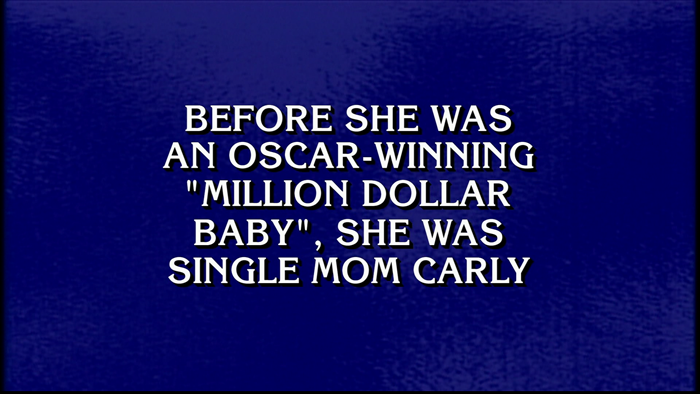 You know your show has made it when it appears on Jeopardy! as a category all its own. On the 12/06/07 edition of the game show, it does just that. $400: Who is Hilary Swank? $600: Who is David Austin Green? 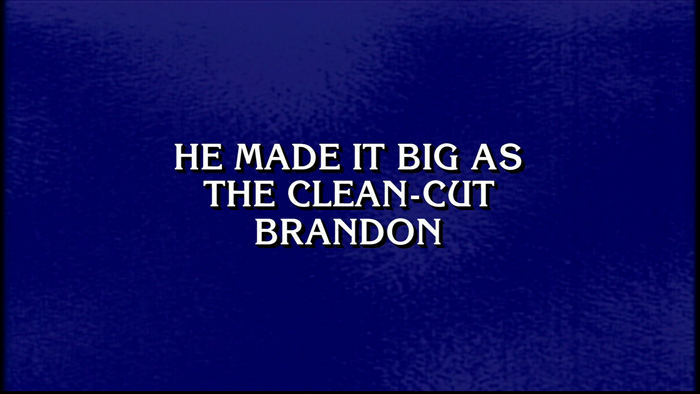 $800: Who is Jason Priestly? $1000: What is the Peach Pit? All two-hr episodes that had a single production number and a single title, are really only single episodes. The Fox numbering system was incorrect. NEW ORLEANS (Variety) - After 10 seasons, countless cast changes and even more hairstyles, "Beverly Hills, 90210" will end its run at the end of this season. "Party of Five," now in its sixth season, will also retire after this broadcast year. With two of its long-term players departing the schedule, and the possibility that "The X-Files" also might end, Fox may be forced to fill a large number of holes in its primetime lineup this fall. Fox execs had previously said "90210" would air as many as 12 fresh episodes in the summer. Thats unlikely now. The series' high costs, dwindling ratings and cast departures all fueled the decisions to pull the plug. Fox execs were apparently unwilling to continue to pay the ever-increasing license fees on "90210," which hover around $2.2 million per episode. It didn't help that the two longtime Wednesday stalwarts have stumbled in the ratings since being separated this season. Season to date, "90210" has averaged 8.4 million viewers, while "PO5," which moved to Tuesdays this season, has averaged 6.8 million viewers. Moreover, many of "90210's" remaining original cast members, including Brian Austin Green and possibly even Tori Spelling, are planning on leaving the show at the end of the season. The same is true at "Party of Five" where Neve Campbell, among others, is also expected to depart. Fox is unlikely to go forward with a "90210" spinoff. It was revealed in the January 17, 2000, issue of Variety that Fox has plans to air new episodes of several shows through the summer, including 90210. It was revealed in the October 18, 1999, issue of Broadcasting & Cable that this will be the last season for the show. FOX Broadcasting Company has ordered at least 28 hours. When asked (9/23/99), the reply was... "So far... 28 and counting..." If they only do 28 hours, that will make 294 episodes when the series finishes (assuming this is the last season :-) Fox claims to be doing the 300th episode this season. Of course, they cheat when they count episodes and specials. FOX Broadcasting Company has picked up its long-running hit drama BEVERLY HILLS, 90210 for the 1999-2000 season, it was announced today by Doug Herzog, President, Entertainment, FOX Broadcasting Company. "BEVERLY HILLS, 90210 is one of the most entertaining ensemble dramas on television and we're happy to bring it back for a tenth season," Herzog said. 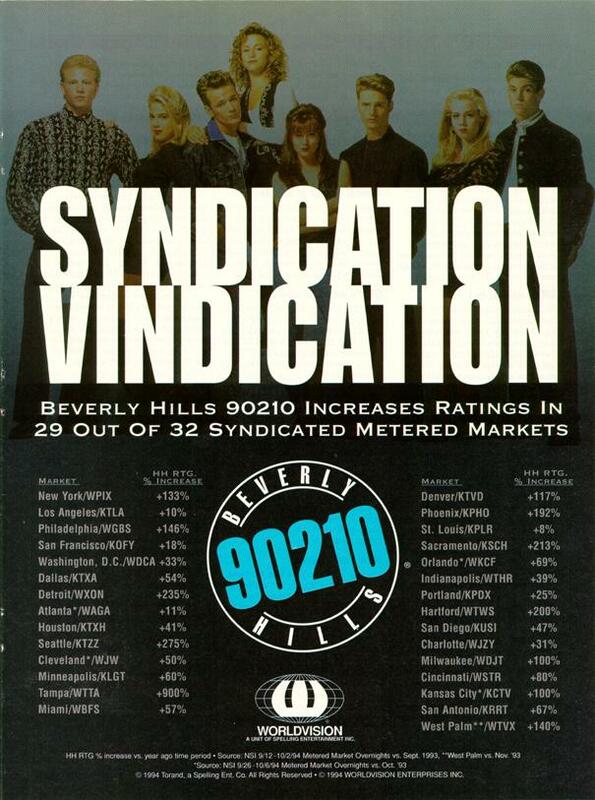 For the current 1998-99 season, BEVERLY HILLS, 90120 is #1 in its timeslot, Wednesdays (8:00-9:00 PM ET/PT), among Women 18-34 (10.9 rating/30 share), Women 18-49 (7.7/20) and Adults 18-34 (8.4/25). Among all regular FOX series, the show ranks #2 with Women 18-34 (10.9/30), trailing only its lead-out, PARTY OF FIVE. When compared with all network regular series programming, BEVERLY HILLS, 90210 ranks #7 among Women 18-34 (10.9/30). "I look forward to another terrific season with FOX and the talented cast and crew of BEVERLY HILLS, 90210," commented executive producer Aaron Spelling. Veteran cast members returning will be Jennie Garth, Tori Spelling, Luke Perry, Brian Austin Green, Ian Ziering, Vincent Young, Lindsay Price, Vanessa Marcil, Daniel Cosgrove and Joe E. Tata. 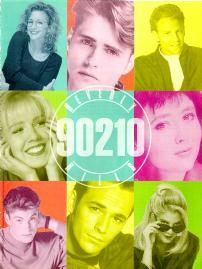 BEVERLY HILLS, 90210 is enjoyed by a wide audience both in the United States and abroad. It is seen by an estimated 200 million people around the world and ranks as one of the most watched American television shows internationally. BEVERLY HILLS, 90210 is a Spelling Television Inc production. Aaron Spelling, E. Duke Vincent, Paul Waigner and John Eisendrath are the executive producers. Laurie McCarthy and Doug Steinberg are the co-executive producers. Brian Austin Green is a producer. A PostScript version of each of the years is available for your printing pleasure. Each of the document links below point to a PostScript file that has been formatted for double-sided printing on your favorite PostScript printer. Yes, you read correctly, you must have a PostScript printer. Sorry, but the printed version is not available for any other type of printer and the source files are not available either. Each of the years are available separately, for when a year is updated, the whole guide does not need to be reprinted, just the year, and maybe the index. Select a section to view on-line (if you can automatically uncompress the file), otherwise do a Save Link As... to capture the PostScript file on your hard disk. The listed size is the compressed size. The files are compressed with the GNU GZIP program. The following versions are available from ftp.uu.net & AOL: Unix, MS-DOS and the Mac. All 2-hour episodes are designed and created as individual one-hours. We then go to the producers and ask them to make specific airdates as two-hours using two episodes. We also ask them to re-format the show so that it only has one opening and one closing credit slot. Because of this reformation, someone in the Spelling Business Affairs department (accounting/legal) probably found it in their best interests to re-number these episodes with a single number...I don't know the exact reasons for their renumbering system. But in our order and airing of these shows they were, are and always will be 2 episodes melded into a special length. It is for my own accounting purposes that I instituted the two-hour/two-episode rule here at FOX. There are several instances, not necessarily with 90210, where we air a show as a two-hour the first time and then repeat it split into two (the same with hour Sitcom special episodes - repeated as two half-hours). This numbering system has been in place since I started here in 1988 (and I went back to April 1987, when FOX started, to re-fix any instances that already occurred). For database purposes and accounting purposes it is necessary to be CONSISTENT among ALL FOX Series. So even if there are zero instances where I repeat a 90210 as a split two-parter, it still gets counted as two episodes. And yes, every two hour episode is listed as BH--2/BH--3 (ie. MELROSE 150th 2-hour on 2/3[/97] is numbered in our books as MP-518/519 [MP-519 = 150]). So, even though the 200th episode is only the 196th episode aired, according to the sequential count, it isn't by FOX's numbering system. Even with this explanation from FOX, I am unable to get the episode count to match Fox. I'm not even going to try, because when it was announced that Fox's cable channel, fX, obtained the exclusive rights to the series, it gave the episode count as 240, which exactly matches my count for eight seasons. This Beverly Hills 90210 Webring site owned by Mr. Video. Want to join the ring? Information available here. Beverly Hills, 90210, its name, logo and photos are a trademark and copyright of Spelling Entertainment Group (213-965-5700). Last modified on Tuesday, 05-Mar-2019 00:14:38 CST.